We just settled nicely into what we grew to love, 2017 wedding trends, rustic, shabby-chic, and vintage! We love the soft hues and flowy fabrics. Touches of metallic, accents with pearls, burlap with lace, mason jars, distressed wood doors and iron gates. All things antique, colored glass, candles and strings of white lights, chalk boards and distressed wood window panes. Beautiful bold colors, jewel tones, black accents. Attire out of flowy, no worries fabrics, some fun with texture and pattern. Velvet and prints stray from traditional, embracing more of an “edgy” spirit. Celestial aura, mindful of the planets, moon and stars, angels and heavens, anything relating to the sky and outer space. Perfect for the unconventional, eclectic and artsy, Boho genre is most definitely not matchy-matchy. For those who thrive with individual expression or personalization. Gone is the stressed out bride-to-be, replaced by tranquility and a serene essence, but most definitely not afraid of spontaneity. Boho style is all about doing things within a nominal budget, being economical. Peruse the second-hand and antique shops. Vintage within a reasonable cost is still the rage. You make the rules, if you both love it, it’s perfect! 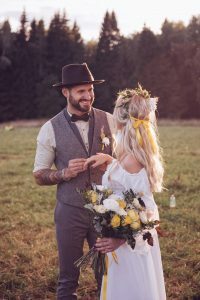 Brides will put aside the expensive white veil for the familiar flower-child accessories of ribbons, lace, feathers and beaded headbands, wreathes of flowers or hair braided to circle her head in a crown, with flower accents. The bride is kicking off her wedge rope heels for flat sandals or better yet, bare feet before making her way down the aisle to her groom. Brides and her bridesmaids may consider two piece attire, flowy pants or skirts and blouses or jumpsuits. Making an entrance is important but so is a fabulous exit! Back details on any outfit are a fashion asset with various width straps, crisscross, cutouts and trains that come from the waist, draping down the back of the dress, all add an eye-catching, interesting features to the view from the back. Let’s not forget the groom, traditional has been the classic black tuxedo. Navy was the new black and now maroon is the new navy. Gentlemen, the jacket does not have to match your pants! Wide open venues, barns, industrial spaces, and most loved the outdoors! Who doesn’t love a blank slate that they can make their own? What décor can compete with lush green grass, mossy stones, and a canopy of trees with beautiful branches intertwined overhead, colorful blooms, or running brooks and streams. Change the scene to crystal blue skies above, airy light clouds drifting with the breeze and sand underfoot. Adding to perfection would be the soothing sound of waves and an occasional seagull in the background. The sky’s the limit, literally! Naked cakes are still the rage, sparsely sugared, iced or glazed. Simple that makes a statement, a drip cake! Bare layers of cake, letting the chocolate or fruit create its own pattern as it is drizzled and dripped down the side of the cake. Edible flowers would beautifully accent either choice. Bottom line, it’s dessert, it’s not traditional, it’s fun and different, it will be delicious and will not last long!